Learn about the Faculty of Native Studies at the University of Alberta, including contact information and FAQs. 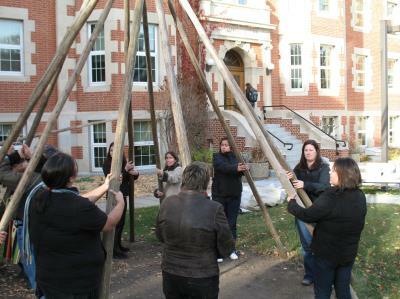 Establishing an academic unit focusing on Native Studies had been discussed within the University of Alberta since 1972, when such a unit was proposed in a University Senate Committee meeting by representatives of the Indian Association of Alberta. In 1978, 20 recommendations were made to the University Senate by its task force regarding improved service to Native people and a more coherent involvement in Native Studies. In that year, the University of Alberta GFC established a Standing Committee on Native Studies consisting of University of Alberta faculty members and students and representatives of the Native community at large. After several years of research, discussion, and consultation with interested individuals and groups from inside and outside the University, the Committee on Native Studies opted for an ambitious program of Native Studies. The Committee on Native Studies proposed the establishment of a School of Native Studies that would be multidisciplinary in character, instead of a small department that would confine itself to Native history, language and culture. The School would offer a wide range of courses leading to a Bachelor of Arts degree in Native Studies, as well as minor concentrations for students in other Faculties. Faculty members and students would engage in research with special attention to language and land use. Though not parochial in its outlook on Native Studies, the Faculty would pay particular attention to Native peoples —Indian, Inuit, and Métis of the Canadian West and North. The establishment of a School of Native Studies and a Bachelor of Arts in Native Studies was approved by GFC and the Board of Governors of the University in Spring 1984. In the same year, the Universities Coordinating Council also approved the School and the degree. 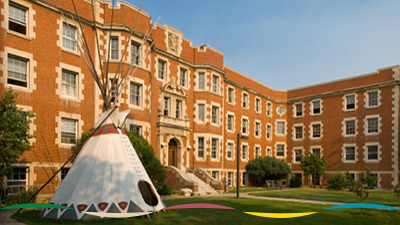 In 1988, the GFC and the Government of Alberta approved a program of study leading to the Bachelor of Arts in Native Studies. With the growth in student and faculty numbers and the expansion of teaching and research came the change from School to Faculty of Native Studies in June, 2006.